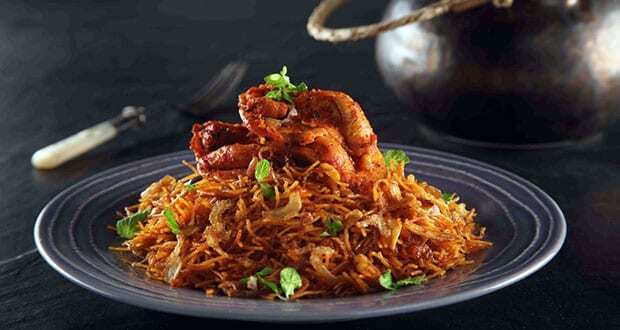 About Riceless Chicken Biryani Recipe: A biryani recipe unlike any you've had before! Adding a twist to the traditional chicken biryani, Tappa brings to you a healthy version of this authentic North Indian dish by replacing rice with vermicelli along with spices such as malabar peppercorns, cardamoms, cloves and red chilli powder. All of this comes together to cook a delicious meal of biryani that will keep you asking for more. 1. Heat pan add malabar peppercorns, cinnamon stick, green cardamom, star anise, cloves, fennel seeds and dry roast together, transfer into a blender to make masala powder. 2. In the same pan, dry roast vermicelli and transfer into a plate. 3. Heat oil in the same pan, add black cumin seeds, bay leaves, green chilies, mint leaves, onions, salt and saute it. 4. Add chicken, ginger garlic paste, turmeric powder, coriander powder, red chili powder, masala powder and mix it, later place lid and cook it. 5. Add tomatoes mix it, cook with the lid on it. 6. Add water, salt, vermicelli and mix it, later cook with the lid on it. 7. Once it is done switch off the flame and allow it to rest for 5 minutes.